Enjoy the natural beauty, security and stability of a concrete receptacle in limited or low volume spaces. The conveniently sized 9 gallon square receptacle is constructed with commercial grade steel rebar reinforced concrete for maximum stability throughout rigorous conditions. A 4-way opening flat top lid provides opportunities to dispose of trash in every direction and deters the collection of precipitation inside the liner. The included liner is made with recycled plastic. The lid is constructed from highly durable polyethylene and will not chip, dent, rust or corrode. 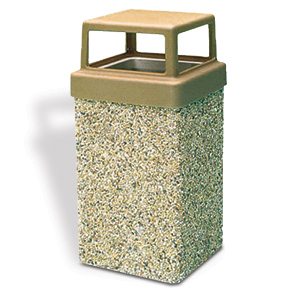 Meet that architectural balance with the ASTM compliant standard and premium finishes available for this 9 gallon square concrete receptacle.